Pansies (Viola × wittrockiana) are compact plants that provide a splash of color in containers. The range of colors includes white, pink, red, orange, bronze, yellow, blue, purple and black, as well as many multicolored varieties. They grow best in full sun to part shade. Pansies are short-lived perennials. They are hardy in U.S. Department of Agriculture plant hardiness zones 6 through 10, but are typically grown as annuals even in these zones. This is mainly because they have a low tolerance for heat and wilt during the summer in zones 8 and warmer. Temperatures around 40 degrees Fahrenheit at night and 60 degrees during the day are ideal. Placing containers in partial shade and making sure the soil doesn't dry out helps keep pansies growing and blooming during the warmer months of the year. Choose a container 9 to 12 inches deep with good drainage; a container with several drainage holes is best. If you really want to use a container without drainage holes, plant the pansies inside a slightly smaller container that does have drainage holes. Place a layer of gravel in the larger container, then set the smaller one inside on top of the gravel. 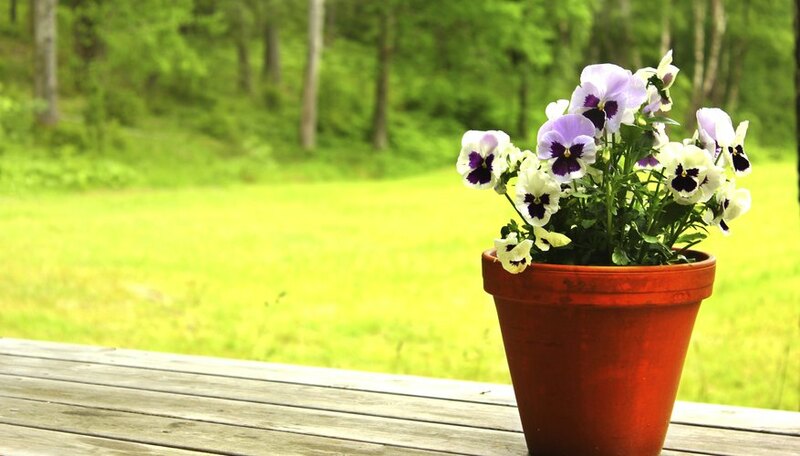 New containers can be used immediately, but if you're reusing old containers disinfect them before planting pansies. Soak used pots in a solution of 1 part bleach to 9 parts water for 10 minutes. Use warm water and dish-washing detergent to scrub soil and mineral deposits off the pots, then rinse them with clean water. Pansies need nutrient-rich, well-drained soil. Use a commercially available potting mix, or make your own. To mix your own potting soil, combine 2 parts weed-free garden soil, 2 parts organic matter and 1 part perlite; coarse peat moss or ground pine bark with a 1/4- to 3/8-inch size are good choices for organic matter. To start pansies from seed, plant them 6 to 8 weeks before you plan on transplanting them to larger containers. For spring planting in zones with cold winters and more mild summers, this means starting seeds 12 to 14 weeks before the last frost date in the spring. For zones with hot summers and mild winters, start seeds in the late summer for planting in the fall once cool weather arrives. Sow seed into seed flats or small containers filled with well-watered potting mix. Cover the seeds with 1/8 inch of potting mix or clean sand to block light. The seeds will germinate in 10 to 14 days when the temperature is kept between 65 and 75 degrees Fahrenheit. Cover the seed flat with plastic film or moist burlap to hold moisture. Remove this cover as soon as the seeds start to sprout. Keep the seedlings in a shaded location until they develop their second set of leaves. After the seeds sprout, let the pansies grow for 6 weeks before transplanting them to larger containers. In zones 8 and warmer, plant pansies after the weather cools in the fall and they will flower until the summer heat kills them the following year. In zones 5 and cooler, plant pansies in the early spring so they can flower through the summer and fall until winter kills the plants. For zones 6 and 7, you can plant in either the spring or fall since the pansies are hardy year-round in these climates. Fill the container you plan to use with potting soil, then tap the containers to settle the soil so it is within 2 inches of the top edge. Make sure the soil is moist when you start planting. Gently remove pansies from their original containers and loosen the roots with your fingers. Plant the plants 6 inches apart in the new containers. Place pansies at the same level they were in the flat or seedling pot, and then firm the soil around the plants. When you're finished planting, water the container thoroughly. Continue to water enough to keep the soil moist, but not soggy. Always water in the morning, and water the soil directly rather than splashing water on the leaves to help prevent disease.